Dr. Franklin entertains and mingles with your guests, striking up lively conversations at your cocktail parties, special events or conventions! Who better than Dr. Franklin to have at Historic Societies, conventions, libraries, other gatherings or as Parade Participant! Dr. Franklin is available for commercial advertising or film making. Why should history be boring? 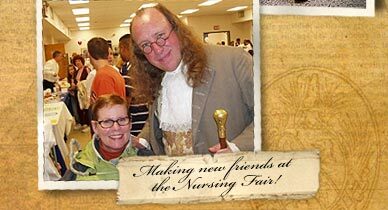 Bill, as Ben Franklin, visits your school and delivers one of four engaging, and entertaining programs! 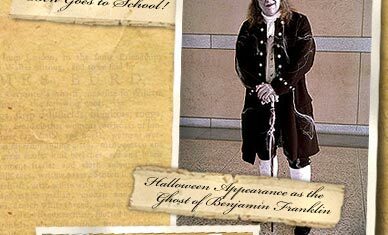 A fascinating biographical presentation in full character & historically accurate clothing, of Benjamin Franklin's life, values and times. Bill will appear in full 18th Century printer's garb, describing the colonial printing trade, complete with hands-on examples of printer's type and colonial currency. A fun-filled visit by Author/Illustrator Gene Barretta, who speaks to the class about the task of writing and illustrating a children's book. 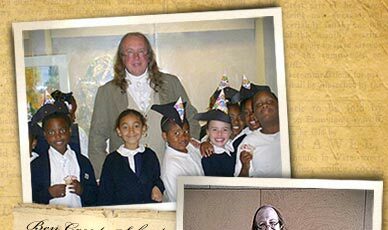 During a reading of his new book "Now and Ben", both Gene and the class will be quite surprised by the unexpected arrival of Ben Franklin himself! For further information, go to Gene's web site at www.GeneBarretta.com. A new, fun interactive program, as the audience is transported back in time, to an 18th century portrait studio where artist/musician Steve Pullara, awaiting the arrival of Dr. Franklin, entertains the audience with song and story. Witty dialogue, fun history facts, drawing lessons and audience participation ensues with Dr. Franklin and Steve! A great program for Grandparents and their grandkids! Hear Steve's music at www.coolbeansmusic.com.